My first thought, on hearing that the Supreme Court upheld the Affordable Care Act subsidies for health insurance purchased on federally-run exchanges, was that SCOTUS just did Republicans in Congress a huge favor. That's because, as the ruling majority, Republicans would have had to figure out what to do about the estimated six million Americans who would immediately lose their subsidies, and thus their insurance, if the court had ruled in favor of the plaintiffs. The best bet was that the Congress would have passed a law extending the subsidies for some time, giving Republicans some breathing room to figure out what to do next. Problem is, Republicans haven't been able to coalesce around any "next" for the past five years, and they would find that writing and passing actual health care legislation is a lot harder than demagoging the current law. They would have been the dog that caught the car, only to realize it did not know what to do with it. Not only are Republicans off the hook for having to pass an actual replacement, they also get to continue to rail against the evils of Obamacare. And they are already railing. House Speaker John Boehner has promised the repeal efforts will continue. Senate Majority Leader Mitch McConell lambasted the law on the Senate floor, saying the law has "been a rolling disaster for the American people." McConnell said the law has "resulted in millions of Americans losing the coverage they had and wanted to keep." The Supreme Court decision, said McConnell, "won’t change the skyrocketing costs in premiums, deductibles, and co-pays that have hit the middle class so hard over the last few years." This amazing collection of assertions is standard Republican talking points, but it flies in the face of actual evidence. And yet, those presumed political advantages from continuing to attack the law may suffer from diminishing and even receding returns going forward, as ever more Americans experience the law's benefits. A new CBS/New York Times poll says that, for the first time since the question has been asked, more Americans approve of Obamacare than disapprove, by a margin of 47% to 44%. The ACA has often been described as a "three legged stool." Leg one is "community rating"—the requirement that insurance companies charge everybody the same premiums for the same coverage. No longer can a subscriber be denied coverage or charged extra because of a preexisting condition like, say, diabetes or heart disease. Before the ACA, preexisting conditions such as these would effectively disqualify an individual from purchasing insurance at all, because the premium charged would be unaffordable. But for community rating to be possible, everybody has to participate, in order to spread the risk and cost as broadly as possible. Thus leg two—the "individual mandate" that requires everybody to carry insurance. Without this requirement there would be strong incentive for people to wait until they got sick to purchase insurance, meaning only sick people would have insurance and the risk pool would be untenable. The result is the so-called "death spiral" of stratospherically high premiums. Leg three is assistance for low income persons who could not otherwise afford the health insurance they are now required to carry. This is accomplished through Medicaid expansion for the poorest, and premium subsidies for those a little better off. Kick out any one leg and the stool collapses. All three legs are required for the stool to stand, and to avoid the perverse system we previously had where being sick disqualifies you from having insurance. Remarkably, the majority opinion's wording showed the court actually understood the interlocking nature of the law's design. The current challenge was about leg three, the subsidies. The question before the court was whether what the law's supporters described as a "drafting error" should disqualify persons in states whose health insurance exchanges are run by the federal government from obtaining subsidies. The plaintiffs said the clear wording of the law was that only persons participating in state-run exchanges qualify for subsidies. Disqualifying federal exchange participants would effectively kick out leg three of the stool, or at least saw a lot of it off. The "inartful" wording causing the controversy was a result of the law's complexity and length, and the way different sections produced by different drafting bodies in Congress were combined at the end. The error was not noticed until it was too late to change it. Nobody really disputes that the law intended for all low income persons to be eligible for subsidies. Even Republicans who were involved at various stages in the law's construction, and who later voted against it, have said that it was never intended to disqualify federal exchange participants from obtaining subsidies. The law was thoroughly debated on the Senate floor, with no mention of a dichotomous subsidy structure. Typically any large piece of legislation has such drafting errors, and Congress later passes, as a routine matter, bipartisan cleanup legislation to clarify and fix them. Such legislation is normally endorsed even by a law's original opponents, since having a duly-enacted law's wording be consistent with the law's intent is a matter of simple propriety and good governance. But such cleanup legislation was not possible in the highly charged partisan atmosphere surrounding the ACA, where Republicans vehemently vowed to take the law down by any means possible (including, as we were later to see, by shutting down the government). And indeed, the court could have punted the law back to Congress, and ruled that it was Congress's responsibility to fix the contradictory wording, if it wanted. That, said Supreme Court expert Linda Greenhouse, would have been a cynical ruling given the present partisan acrimony over the law. Many saw the Supreme Court's willingness to consider this particular challenge a dark omen, since, in their view, the case was without serious merit and could readily have been ignored. It was always widely believed that the court was unlikely to strike down the subsidies, but the fact that it was being considered at all kept supporters on edge. But by a 6-3 margin, and with a strongly worded majority opinion by Chief Justice John Roberts, the court stated the obvious and said that having subsidies available on the state exchanges but not the federal exchanges made no sense when considering the law as a whole, and thus could not have been what the Congress intended. Obamacare is undeniably now the law of the land, having survived two Supreme Court challenges and unlikely to face another. Will Republicans continue to oppose it? Such opposition might play well with the base, but it could increasingly alienate a majority of Americans who gradually come to understand the law's advantages, and eventually come to see the strong evidence that the law is working. 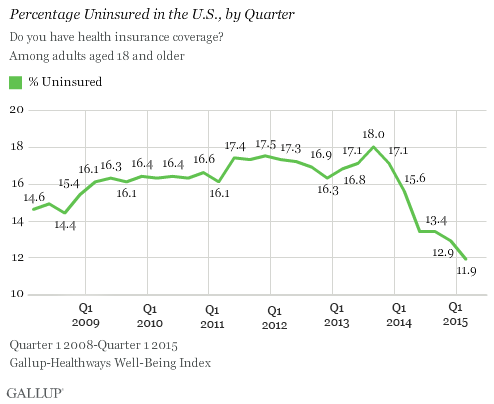 The percentage of uninsured Americans has dropped by about a third since the exchanges began operating and Medicaid expansion took effect. And the drop would have been far greater had Medicaid expansion not been blocked by a large number of Republican-controlled states. As with much of Republican politics-as-usual (such as the inability to come to terms with the changing demographic makeup of the country), things get worse the farther out you look.